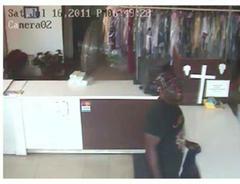 • On Saturday July 16, 2011 at 6:49pm, two offenders entered Ashland Cleaners located at 8206 S. Ashland, displayed a handgun and demanded money form the clerk. 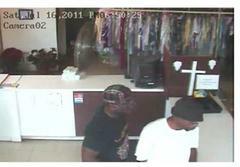 The above offenders took the money and fled westbound on 82nd street from Ashland. • The first offender was described as a male black, 30-35 years of age, 5'10-190-200lbs, wearing a black Kango hat, black t-shirt and black jeans. • The second offender was described as a male black, 30-35 years of age, 5'08, 150-160lbs, wearing a white t-shirt with blue jeans. • These offenders should be considered armed and dangerous. • Be aware of this situation and alert neighbors in the area about the crime. • If possible, don't walk alone and stay in well lit areas. • Call 911 to report any suspicious person(s), vehicle(s) or activity in your neighborhood. • Call 911 and provide a detailed description of the offender(s) including the vehicle description and license plate information.